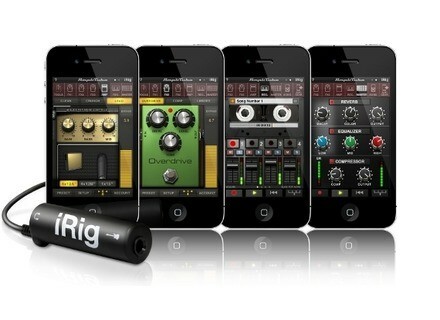 Amplitube 2 for iPhone, Virtual effect for iPhone / iPod Touch / iPad from IK Multimedia in the Amplitube series. 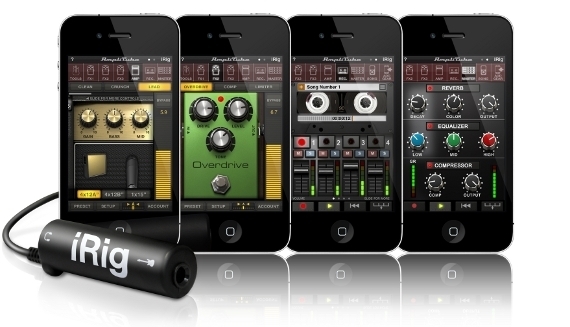 IK Multimedia updated the AmpliTube App for iOS devices in order to add a programmable drum recorder to the guitar and bass multiFX processor. With Loop Drummer available inside of AmpliTube v2.9, users can jam and practise over single loops or entire drum sequences, or they can compose a full-length drum track (with intro, groove variations, fills, and ending) to be used as a start-up rhythmic base for recording full multitrack compositions on the AmpliTube recorder. A Remix feature allows the production of an entire drum track with a single tap, using an intelligent algorithm that sequences the loops. At each tap on the Remix button, a new track is generated. Alternatively a drum part of any length can be produced by dragging loops into the timeline. Any of the loops can also be customized with the Cymbal button, which sets a crash on the downbeat. A Tap Tempo button is also available for changing loop tempos, and the module is equipped with a time-stretching algorithm that automatically processes the loops when the tempo is changed. Loop Drummer has its own built-in mixer controls, with a circular volume control that allows for adjusting the overall drum level, independent of the recorder's volume, and also functions as a reverb send. In addition to Loop Drummer, the new AmpliTube 2.9 adds a new pre-roll feature to the recorder, that can be turned on and off. The pre-roll gives the musician who is recording two measures to lock in on the groove before recording starts, making it easy to play in tempo from the very first beat. Orange Tree Samples models a Yamaha C7 Orange Tree Samples introduced Evolution Rosewood Grand, a Yamaha C7 grand piano sample set library. Magellan Synth App updated to v2.1 Yonac updated its Magellan synth app on iPad to version 2.1, which adds compatibility with Audiobus. Spitfire Grand Cimbalom for Kontakt Spitfire completes its sonic arsenal for Kontakt with Grand Cimbalum, a virtual instrument sold at the special introductory price of £41.